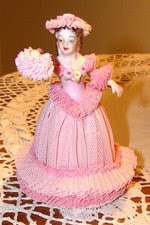 pink chenille brooch, originally uploaded by suesueb. good saturday morning to all-pink and otherwise!! i'm celebrating my 1st blogiversary and want to give this pink chenille brooch to the winner! i'm also giving away a vintage button bracelet for another prize but i don't have a picture of that. my random generator (my mom) will choose a number for me from the comments and next wednesday i'll post the names as soon as i can. hope all of y'all join me in celebrating!! things around home have been pretty quite. we took a little 3 day vacation to lake charles casino and really had a great, relaxing time. (except for the sunburn!) the lazy river and kiddie pool there are so nice and georgia and will both loved it!! also been staying with my mom some nights 'cause my sister who lives with her is out of town. that's a vacation too-can't compute so i get to read (all of the twilight books-very entertaining) and knit. almost finished g's dress for the fourth of july. should be able to catch up with pictures of that and a couple of other projects next week since lee will be home with my camera. next monday i'll finally get my lovely root canal and hopefully will be finished with that pain if it can be done! going blog hopping now to other "pink" sites-hope y'all have a great weekend and sending happy father's day wishes to your families too!! Well happy blogiversary to you - couldn't think of a better way to celebrate with a 3 day holiday! Very nice for you to have that relaxing time :-)and Congratulations too! I remember those brooches you made. Happy blogiversary to you & Happy Pink Saturday! Enjoy a wonderful weekend. Happy Pink Saturday and Anniversary! Please enter me, that brooch is wonderful!!! The pink brooch is beautiful. Happy aniversary. Happy blogiversary! What a neat brooch you have made. Here's to more years of blogging! Happy Pink Saturday! Lovely brooch, and the ladybug is a perfect touch! Happy Blogiversary! Wishing you and those you l♥ve a weekend filled with sunshine, good food and many, tender memories. Happy Blogiversary! Thanks for sharing. Happy Pink Saturday! Congrats! I just had mine at the beginning of the month, 1 year! Happy ps! Congratulations! And, happy Pink Saturday. Your brooch - and everything you do - is great. I hope that root canal takes it easy on you. Happy Blogiversary! Nice to hear you had some quality vacation time! I am about midway through the first book in the Twilight series! I LOVE it! I hear the dolls are coming out, and I can't wait! Happy Pink Saturday, and have a wonderful week! Happy Blogiversary. Happy Pink Saturday! Loved your random generator comment. Wow, this is so neat. Someone will be very lucky to win this. Happy anniversary! What a lovely brooch! How very kind of you to give away a piece of your art....I wear lots of brooches...vintage ones that is. In 7 posts I will reach my 100th post. I started in January of 2009. Blogging has been a lifeline for me. HAPPY FATHERS DAY to the men in your life. and a 3 day vacation sounds like a dream come true!!! Happy Blogiversary! Happy Pink Saturday! Congrats on your blogging milestone--toss my name in the hat for your giveaways, woo-hoo!! Happy PINK to you! And Happy Blogiversary too! The chenille brooch is cute. :0) Have a fun week and drop for a visit anytime! Congratulations on your blogversary. How nice. Love the brooch, the giveaway is a lovely way to celebrate. A very Happy Pink Saturday to you! What a lovely post - I adore the Pink flower. A Happy Pink Saturday to you and have a wonderful new week. Happy Blogaversary, and a very Happy Pink Saturday.